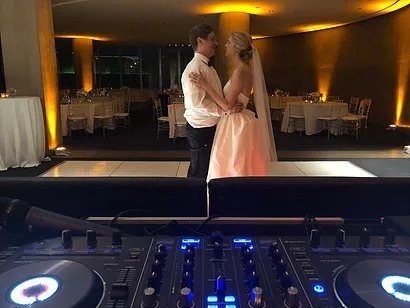 This past Saturday night I played DJ, MC, Lighting dude, and overall Experience Jockey for two incredibly wonderful people and 126 of their closest family and friends. While the guest count may not sound too intimidating to most, the energy radiating from this group of people may have been the strongest I’ve seen in my years at the helm of such celebrations.  Whether you’re planning a wedding and just want some inspiration, work in the wedding industry and want to hear some real “what works well” truths, or you’re an entertainer who loves to share tales of epic nights, this party was one for the books. There’s so much to write about, that I’ve decided to make this my first two part blog series that I’ll call The Perfect Storm. The first section (the one you’re reading now) will recap the night in all its glory. In the second part, I’ll deconstruct WHY this party was so amazing and the little details that made it that way. So enough blabbing…it’s story time! city just north of Dallas, home on break from the University of Texas in Austin, and struck up a conversation while waiting for their numbers to be called. Speaking of numbers to call, Austin tracked Kelly down in the parking lot, got her number, and invited her to lunch. A bold move that would certainly change his life forever! 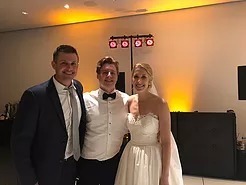 We had actually rubbed elbows before when I performed a live acoustic set and DJ set for his brother (Best Man Eric Hall) and his wife Hannah back in 2015. I already had a good vibe from this family and knew this event would be a good time- and meeting up for drinks and creative conversations throughout the planning process certainly confirmed that. These two and their guests were primed for the party from the moment they walked in the room. Not only was this a fun, well-dressed bunch looking to have a good time, but a very loving, connected, and grateful group of people who were celebrating love above all else. As I met the bridal party out in the main foyer at The Modern Art Museum of Fort Worth, hugs were abundant amongst the guests of honor, the bridal party, and even Austin’s parents Dennis and Becky who I was excited to see again (Dennis gives a great toast and Becky is no stranger to a dance floor)! There were emotional moments and excitement (“we can’t wait to get in there”) as I got everyone ready for the grand entrance. Standing here before everybody, I have to admit,, I do consider myself the luckiest man in the world. Guests erupted in applause and cheers. As we all know, I couldn’t ask for a better family. You don’t get to choose what family you’re born into, and I hit the lottery. They’ve been nothing but supportive- and I’m lucky that I got to roll into the DMV and walk out with this! Dad, I need you. Come rescue me. Come bail me out” Not the first or last time that’s happened. Dennis gave the blessing and dinner began with Green Onions by Booker T & The MGs- a classic dedicated to “PawPaw” Glenn Hall who was on hand to celebrate. “returned the favor” from 3 years ago, roasting his brother in hilarious fashion. Kelly invited her stepfather Mark out for a special dance to Luke Bryan’s “Most People are Good” (As a stepdad, I always have a soft spot for these moments), and Austin brought his mother Becky out for Tim McGraw’s “Humble & Kind” which at about a minute in (at their request) I scratched into “Hit The Road Jack” which brought cheers from the guests and without me even saying anything, brought the entire party to the dance floor- and we never looked back! The walls suddenly changed from elegant amber to dynamic color washes that danced with the beat, adding a dynamic energy to the room on top of what was already there. Aunts and Uncles who call themselves “The Brickhouse Gang” got their taste of 70s funk and disco, a dance circle broke out around 2 amazing Michael Jackson impersonators, the 90s kids got everything from The Backstreet Boys to House of Pain, and the crowd chorus of “Get Low” by Lil Jon & the Eastside Boyz was worthy of a Grammy. There was no slowing this train down. Photographers had to get creative with high reaching overhead shots because they couldn’t get on to the dance floor. We had to postpone the garter and bouquet toss because the bride and groom themselves were stuck in the thick of it. ared the floor for Kelly & Austin as they danced to I’ll Name The Dogs by Blake Shelton- which was not only a nice break and nod to the country fans in the room, but apparently the tale of a real life discussion between the newlyweds. 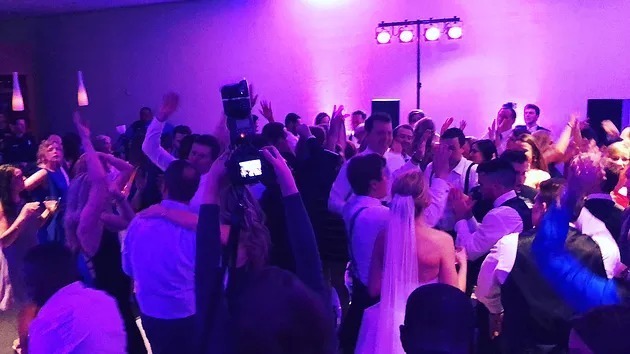 After tossing the bouquet and garter to raucous groups of bachelors and bachelorettes, there wasn’t a second to spare before everyone re-invaded the floor for end-of-the-night group hug sing-alongs that culminated with the loudest “Sweet Caroline” I’ve ever heard. And through all the madness- a private last dance. A moment for Austin & Kelly to reconnect on this crazy night, to celebrate alone, and to take a moment to look forward to all that life is going to bring them. Coldplay’s Fix You was the perfect soundtrack for this moment. After a big sweaty end-of-the-night hug, a vendor selfie with the team at Peyronet photography (love this group), and a speedy strike & load-out thanks to my assistant Nick, we were on our way home, and Austin & Kelly were on their way to honeymoon in Maui (though we’re guessing they were at the after party). It was hard to turn the music off that night. We tore down the speakers at 11:30 and were out within an hour, but the beats were definitely pulsing through my veins for hours after, as I came home, replayed the night in my head, flipped through photos, and was finally able to sleep around 2:30 AM. Austin & Kelly, you are amazing people, and I’m so lucky to know you and your families. I have a feeling we’ll be staying in touch long after this epic party! n my next edition of this blog, I’ll be sharing some of the details on WHY this party was so awesome. There are so many little things you can do in your planning process or in the heat of the moment that can completely change the dynamics of a party- and teaming up with Austin & Kelly made that a very fun and rewarding process.